The 2009 Proof Platinum Eagle was released by the United States Mint on December 3, 2009. It marked the first coin of a new six year program of reverse designs to be featured on the collectible version of the platinum coins. Each design will highlight one of the core concepts of American democracy, as stated in the Preamble of the Constitution of the United States. The first design represents the concept “To Form a More Perfect Union” with a diversity theme. Four faces are presented with hair and clothing intertwining to represent the diversity of the Nation. The eagle on the reverse will be represented by a privy mark or coin punch that depicts the head of a bald eagle. This reverse was designed by Susan Gamble and sculpted by Phebe Hemphill. The obverse of the coin featured a rendition of the Statue of Liberty designed by John Mercanti. This design has been used on all bullion and collectible American Platinum Eagle coins since the coins were first offered in 1997. The 2009 Proof Platinum Eagle was only issued on one ounce size. In previous years the coins had been available in three additional fractional weights and in collectible uncirculated version. These additional versions were discontinued at the end of 2008. The coins have a maximum authorized mintage of 8,000 coins and were limited to five coins per household. The coins were priced at $1,792 each. The 2009 Proof Platinum Eagle sold out within two week of release. 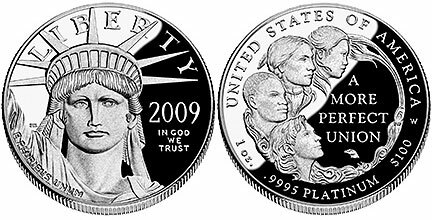 Notably, the United States Mint did not produce any platinum bullion coins or other collectible platinum coins during 2009.